At dawn this Saturday, three men lost their lives after being attacked with firearms in front of a bar located in the downtown area of Puerto Vallarta, Jalisco. Around 4:30 am, elements of the Municipal Police received the report that between streets Morelos, Josefa Ortiz de Dominguez and Leona Vicario, several gunshots were heard. 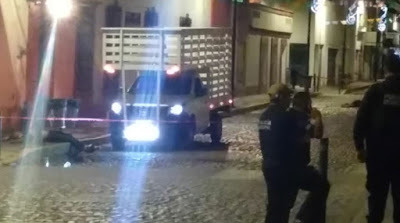 When bequeathing, the agents noticed that outside the bar with "La Casona" there were three injured people with bullet wounds, these were examined by paramedics who announced two dead, and one was seriously injured, who died on transport to Regional Hospital. One of the victims was a Marine. This is s few steps from the casino that has a rough crowd in the evening. This bar is downtown, but not really a tourist bar. Still, this is out of the ordinary for this area with a high police presence. Nothing good happens at 4:30AM (if you never went to bed).